EEN-EN001 Zure, Knight of Dark World/Fiend/DARK/4 Stars/ATK 1800/DEF 1500/The name of this illustrious knight is known by all residents of the Dark World. He never oppresses the commoners. EEN-EN002 V-Tiger Jet/Machine/LIGHT/4 Stars/ATK 1600/DEF 1800/The ace fighter is unbeatable in a dogfight. It combines with other monsters to launch an array of encircling attacks. EEN-EN003 Blade Skater/Warrior/EARTH/4 Stars/ATK 1400/DEF 1500/An image of beauty on the ice, this gorgeous warrior rips her opponents into pieces with her stylish Accel Slicer attack. EEN-EN008 Elemental Hero Wildheart/Warrior/EARTH/4 Stars/ATK 1500 /DEF 1600/This card is unaffected by the effects of Trap Cards. EEN-EN012 Infernal Incinerator/Fiend/FIRE/6 Stars/ATK 2800/DEF 1800/This card can only be Normal Summoned or Set by discarding all card(s) in your hand to the Graveyard except this card, as well as Tributing 1 card with 2000 ATK or higher from your side of the field. Increase the ATK of this monster by 200 points for each monster on your opponent’s side of the field. Decrease the ATK of this card by 500 points for each monster on your side of the field, except this card. EEN-EN013 Hydrogeddon/Dinosaur/WATER/4 Stars/ATK 1600/DEF 1000/When this card destroys an opponent’s monster as a result of battle and sends it to the Graveyard, you can Special Summon 1 “Hydrogeddon” from your deck. EEN-EN014 Oxygeddon/Dinosaur/WIND/4 Stars/ATK 1800/DEF 800/When this card is destroyed as a result of battle with a Pyro-type monster and sent to the Graveyard, inflict 800 points of damage to both players’ Life Points. EEN-EN016 Etoile Cyber/Warrior/EARTH/4 Stars/ATK 1200/DEF 1600/If this card attacks your opponent’s Life Points directly, increase the ATK of this card by 500 points during the Damage Step only. EEN-EN018 Nanobreaker/Machine/EARTH/4 stars/ATK 1600/DEF 1800/If this card attacks a Level 3 or lower monster, destroy the monster with this card’s effect without applying Damage Calculation. EEN-EN020 Beiige, Vanguard of Dark World/Fiend/DARK/4 Stars/ATK 1600/DEF 1300/IF this card is discarded from the hand to the Graveyard by a card effect, Special Summon this card to your side of the field. EEN-EN025 Scarr, Scout of Dark World/Fiend/DARK/2 Stars/ATK 500/DEF 500/When this card is destroyed as a result of battle and sent to the Graveyard, add 1 Level 4 or lower monster that includes “Dark World” in its card name from your deck to your hand. EEN-EN026 Familiar-Possessed-Aussa/Spellcaster/EARTH/4 Stars/ATK 1850/DEF 1500/By sending 1 “Aussa the Earth Charmer” and 1 EARTH monster from your side of the field to the Graveyard, you can Special Summon this card from your hand or Deck. If you Special Summon this card in this way, this card get’s the following effect: During battle between this attacking card and a Defense Position monster whose DEF is lower than the ATK of this card, inflict the difference as Battle Damage to your opponent’s Life Points. EEN-EN027 Familiar-Possessed-Eria/Spellcaster/WATER/4 Stars/ATK 1850/DEF 1500/By sending 1 “Eria the Water Charmer” and 1 WATER monster from your side of the field to the Graveyard, you can Special Summon this card from your hand or Deck. If you Special Summon this card in this way, this card get’s the following effect: During battle between this attacking card and a Defense Position monster whose DEF is lower than the ATK of this card, inflict the difference as Battle Damage to your opponent’s Life Points. EEN-EN028 Familiar-Possessed-Hilta/Spellcaster/FIRE/4 Stars/ATK 1850/DEF 1500/By sending 1 “Hilta the Fire Charmer” and 1 FIRE monster from your side of the field to the Graveyard, you can Special Summon this card from your hand or Deck. If you Special Summon this card in this way, this card get’s the following effect: During battle between this attacking card and a Defense Position monster whose DEF is lower than the ATK of this card, inflict the difference as Battle Damage to your opponent’s Life Points. EEN-EN029 Familiar-Possessed-Wynn/Spellcaster/WIND/4 Stars/ATK 1850/DEF 1500/4 Stars/ATK 1850/DEF 1500/By sending 1 “Wynn the Wind Charmer” and 1 WIND monster from your side of the field to the Graveyard, you can Special Summon this card from your hand or Deck. If you Special Summon this card in this way, this card get’s the following effect: During battle between this attacking card and a Defense Position monster whose DEF is lower than the ATK of this card, inflict the difference as Battle Damage to your opponent’s Life Points. EEN-EN038 Dark World Lightning/Normal Spell/Select 1 face-down card on the field and destroy it, and after that, select and 1 card from your hand and discard it to the Graveyard. EEN-EN039 Level Modulation/Normal Spell/Your opponent draws 2 cards. Special Summon 1 monster from your Graveyard that includes “LV” in its card name, ignoring the Summoning conditions. The monster that was Special Summoned by this effect cannot attack, nor activate or apply it’s effect this turn. EEN-EN040 Ojamagic/Normal Spell/When this card is sent from the hand or the field to the Graveyard, add 1 of each “Ojama Green”, “Ojama Yellow”, and “Ojama Black” from your Deck to your hand. 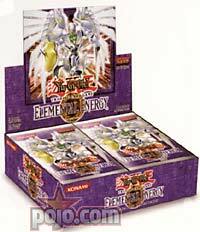 EEN-EN041 Ojamuscle/Normal Spell/Select 1 face-up “Ojama King” on the field. Destroy all monster(s) on the field that include “Ojama” in their card name, except the selected “Ojama King”. Increase the ATK of the selected “Ojama King” by 1000 points for each destroyed monster. EEN-EN043 Bonding-H20/Normal Spell/Tribute 2 “Hydrogeddons” and 1 “Oxygeddon” on your side of the field. Special Summon 1 “Water Dragon” from your hand, Deck, or Graveyard. EEN-EN046 Branch!/Continuous Spell/When a Fusion Monster on the field is destroyed and sent to the Graveyard, you can Special Summon from your Graveyard 1 of the Fusion Material Monsters that you used for the Fusion Summon of that Fusion Monster. EEN-EN047 Boss Rush/Continuous Spell/The controller of this card cannot Normal Summon or Set. During the End Phase of the turn that a monster on your side of the field that includes “B.E.S.” in its card name, or is named “Big Core” is destroyed and sent to the Graveyard, you can Special Summon from your Deck 1 monster that includes “B.E.S.” in its card name, or is named “Big Core”. EEN-EN048 Gateway to Dark World/Quick-Play Spell/If you activate this card, you cannot Normal Summon, Flip Summon or Special Summon during the turn this card is activated. Special Summon from your Graveyard 1 monster that includes “Dark World” in its card name. EEN-EN051 The Forces of Darkness/Normal Trap/Return 2 monsters from your Graveyard to your hand that include “Dark World” in their card names. EEN-EN052 Dark Deal/Normal Trap/You can only activate this card by paying 1000 Life Points when your opponent activates a Normal Spell Card. The effect of the Normal Spell Card that your opponent activated at that time becomes “Your opponent discards 1 random card from their hand”. EEN-EN053 Simultaneous Loss/Normal Trap/Each player sends the top card of their Deck to the Graveyard. EEN-EN054 Weed Out/Normal Trap/Pay 500 Life Points. Destroy all Level 3 monsters in face-up Attack Position on the field. EEN-EN055 The League of Uniform Nomenclature/Normal Trap/Select 1 face-up Level 2 or lower Normal Monster on your side of the field to activate this card. Special Summon from your Deck to your side of the field as many cards as possible with the same name as the selected monster. EEN-EN056 Roll Out!/Normal Trap/Select 1 Union Monster in your Graveyard and equip it to an appropriate monster on your side of the field. EEN-EN057 Chthonian Polymer/Normal Trap/You can only activate this card when your opponent Fusion Summons a Fusion Monster. Tribute 1 monster on your side of the field to take control of that Fusion Monster. EEN-EN058 Feather Wind/Counter Trap/You can only activate this card if there is a face-up ”Elemental Hero Avian” on your side of the field. Negate the activation of a Spell or Trap Card and destroy it. EEN-EN059 Non-Fusion Area/Continuous Trap/Neither player can Fusion Summon.